Hello again! 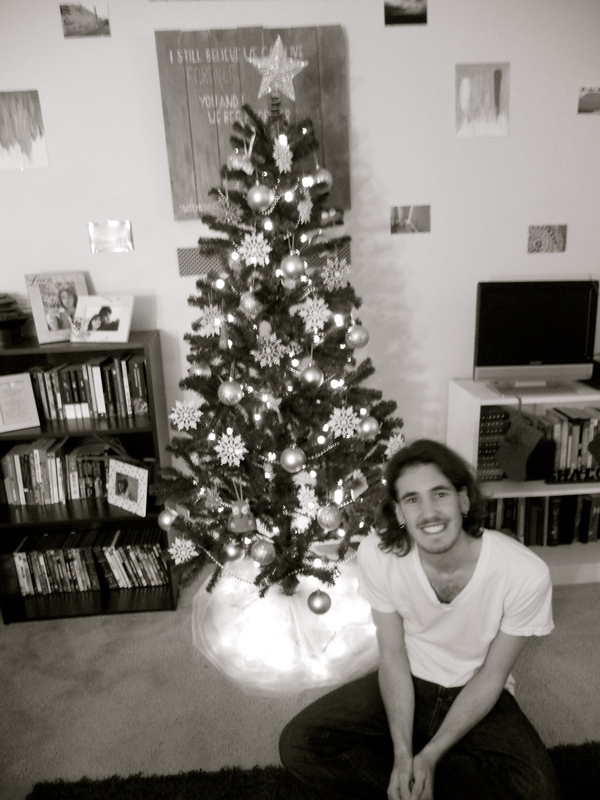 It’s time for the second installment in the sustainable Christmas series. In doing this, I am deviating from the standard topics of this blog to give you a few tutorials on Christmas presents and other accouterments you can make yourself (instead of purchasing them at Target). 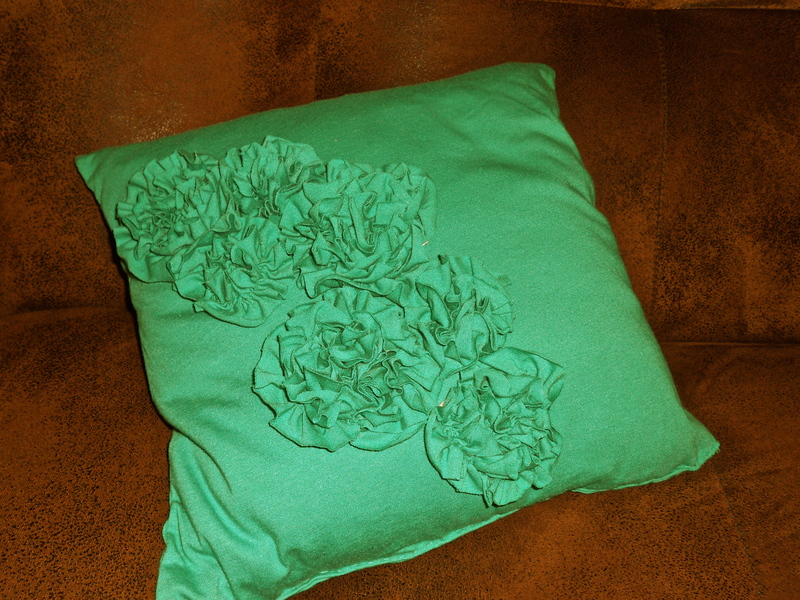 This project is a ruffled flower t-shirt pillow that is stupid easy and very cheap. Originally found here. I’m giving this to my sister (-in-law), who is 16 and loves bright colors. It’s a great gift for a teenage girl–especially those ones you might not know very well but are obligated to give something to–but could easily be classed up by using lightweight wool felt and more adult colors. My apologies in advance for the horrible pictures. I actually made this about a month ago, and did not document it, so I had to Paintbrush it up. Take one of the two shirts and lay it flat on a table or other hard surface. Cut off the hem on the bottom. 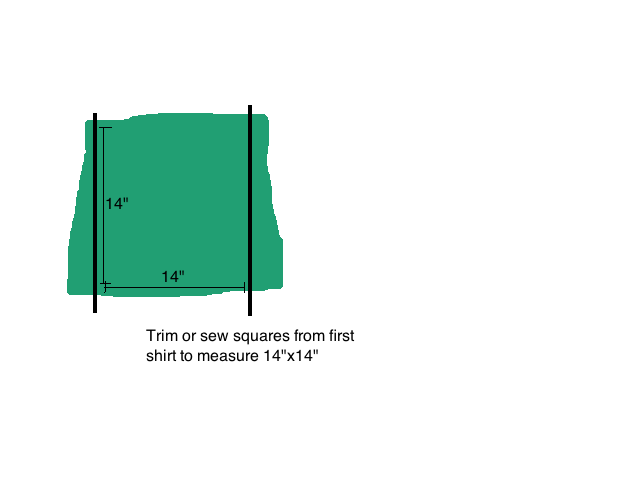 Measure 14 inches (for a 12-inch pillow) up from the bottom edge and cut straight across. Don’t worry if the shirt itself is wider than 14 inches–as long as it is at least this wide, it doesn’t matter. Set this aside. 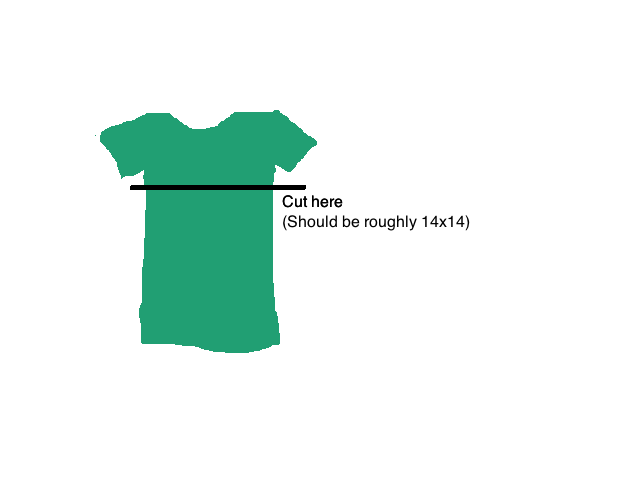 Take the other shirt and cut off the bottom hem, same as the previous shirt. 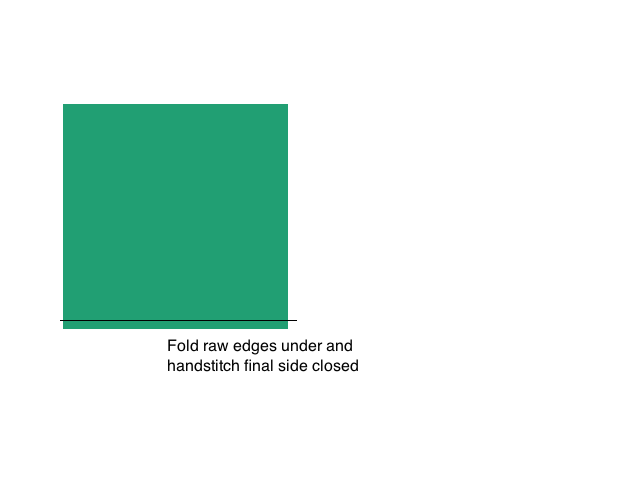 Mark out lines in increments of 1.5 inches up from the bottom edge. 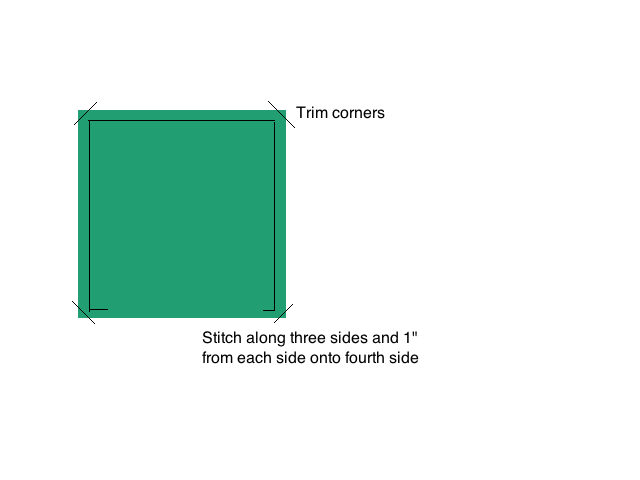 Cut along these lines to make six strips. Cut each strip along the side seams to make twelve strips. Round the corners of each strip. Then, baste (like in the last project) down the middle. 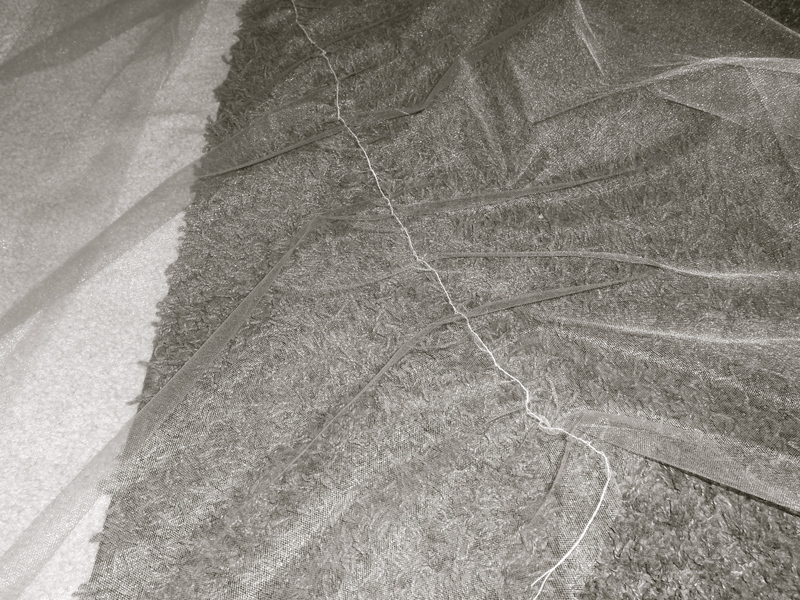 Tie off one end and gather the strip until it is about half of its original length.Tie off the other end. 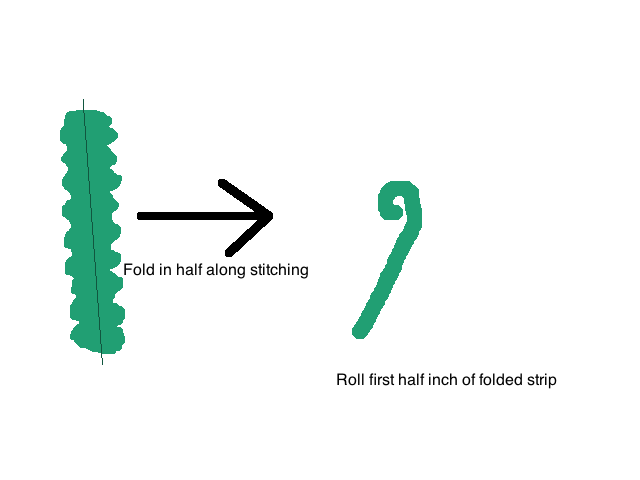 Fold the strips in half along the stitching. Set these aside. Trace out four 3-inch and three 2-inch diameter circles on your sheet of felt. Cut these out. This is where it gets a little difficult to explain in words. 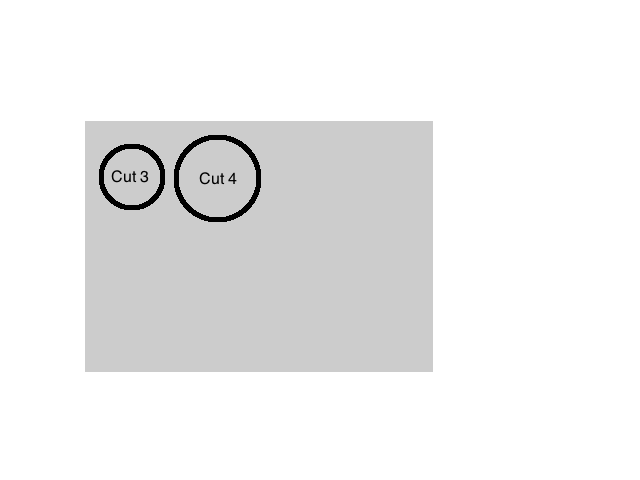 With your strips readily accessible, put a glob of hot glue in the middle of these circles (do one at a time). Roll up half an inch or so of one strip and place this on the glue. 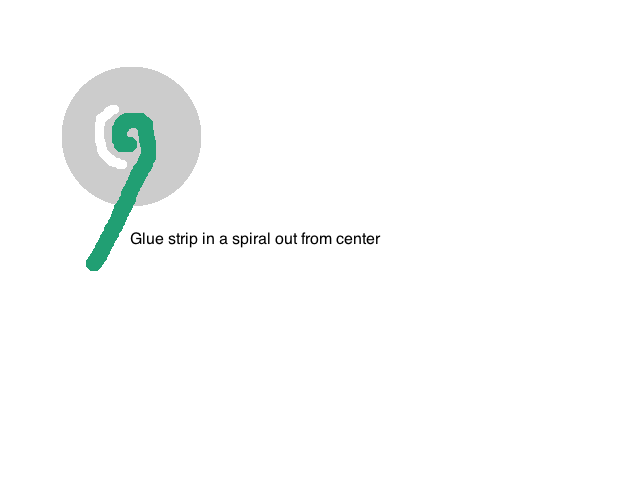 Keep adding glue and strip in a spiral out toward the edge of the felt circle.Your 3-inch circles will get two strips, and the 2-inch circles will get one. 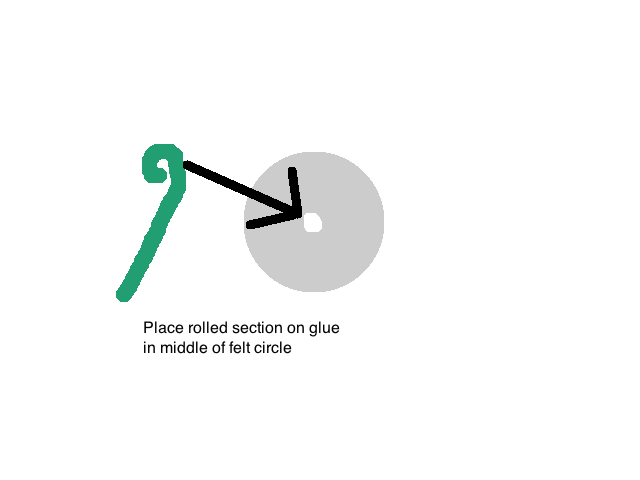 Trim the felt as close to the glue lines as possible. Set these aside. You will end up using eleven strips to make four 2-strip flowers and three 1-strip flowers. If you want, you could make an additional 1-strip flower. Go back to the square you cut from the first t-shirt. 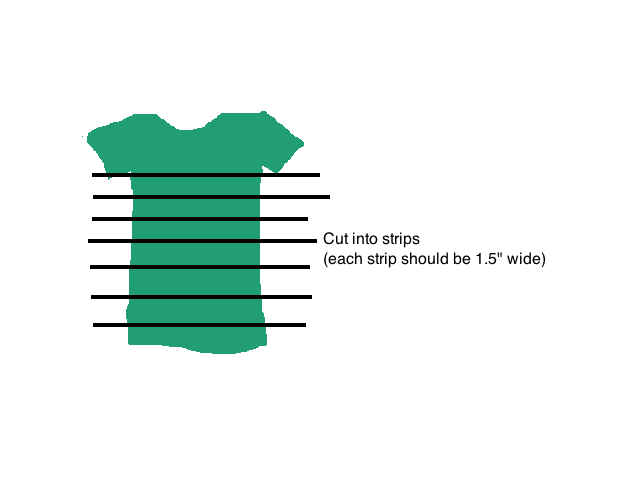 Because your shirt will likely not have perfectly straight sides, you may have to even these out. Cut (or stitch up the sides) so that it measures 14×14 inches. Stitch along three sides and an inch or so into each end of the fourth side, leaving the rest open for stuffing.Clip the corners down and turn right side out. Insert your pillow form or stuffing into the pillow. Folding the raw edges under, handstitch up the last side with a simple running stitch. 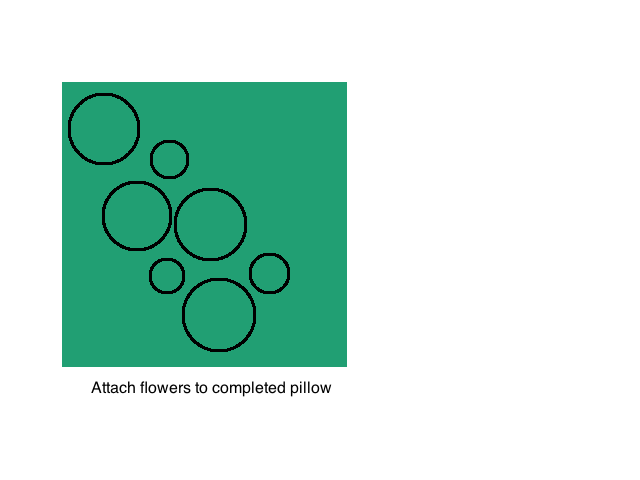 Take the flowers you made earlier and arrange them on the pillow. Hot glue these in place, making sure to secure them well. Admire your handiwork. You’re awesome. Give yourself a high five just for the hell of it. Altogether, this cost me less than $3–I found two matching shirts at Goodwill for $.99 each, and the felt was on sale for $.25/sheet but is usually $.35 or so. I think I had the pillow form, but these are not expensive and you can find them in almost any craft store. If you choose to go the stuffing route, a bag of fiberfill will run you $6 or so. Easy, cheap, and sustainable! If you aren’t super crafty, you can find some great pillows similar to this one here. As you have (hopefully) read, this year, the Andersons are doing a sustainable Christmas. As a part of this, I am deviating from the standard topics of this blog to give you a few tutorials on Christmas presents and other accouterments you can make yourself (instead of purchasing them at Target). 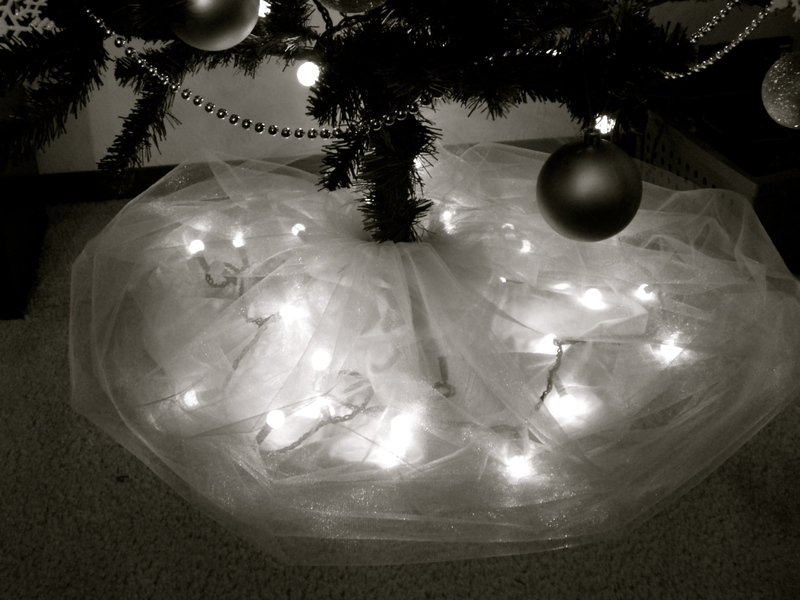 The first project on this list is a super-easy tulle tree skirt. Find the center of your fabric. Your fabric should come folded in half on the bolt; the fold line from this makes a convenient marker. If not, measure across the shorter side to find the middle, then use a pen/marker to draw a line down the middle from end to end. Baste along this line. 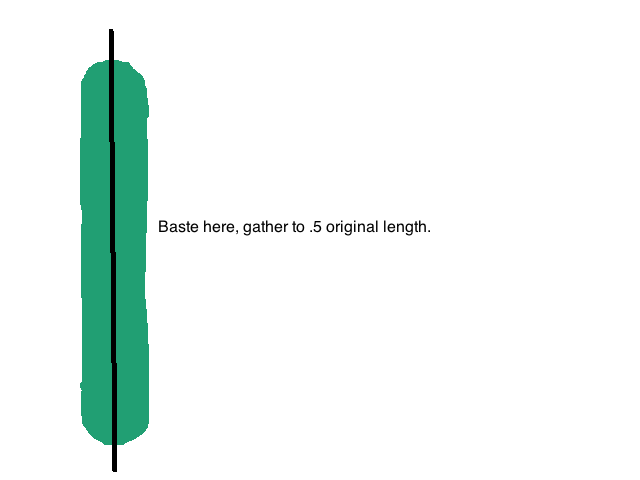 “Basting” means to stitch a simple straight stitch at a high stitch length. If you are handsewing, a simple running stitch will work just fine. 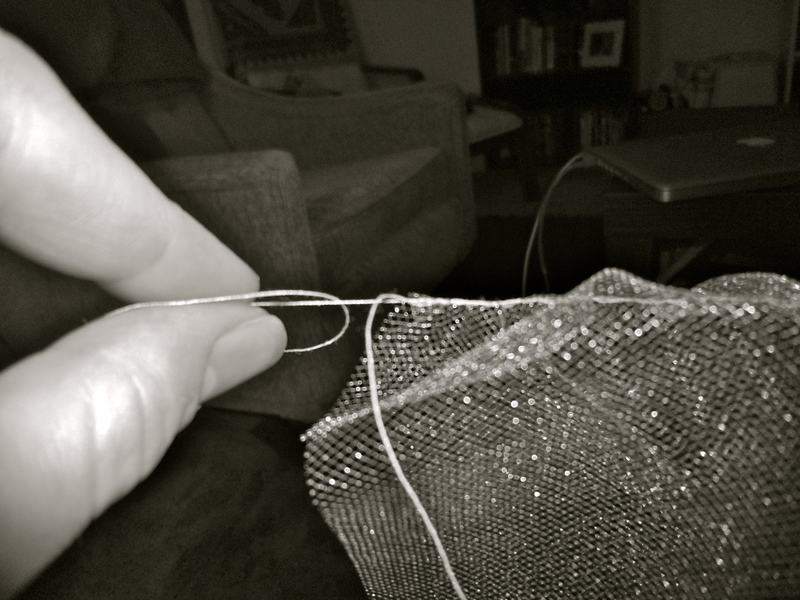 Make sure you leave long tails of thread at each end. Tie a knot at one end of this stitching. This is very important, otherwise you will need to restitch everything you’ve just done. 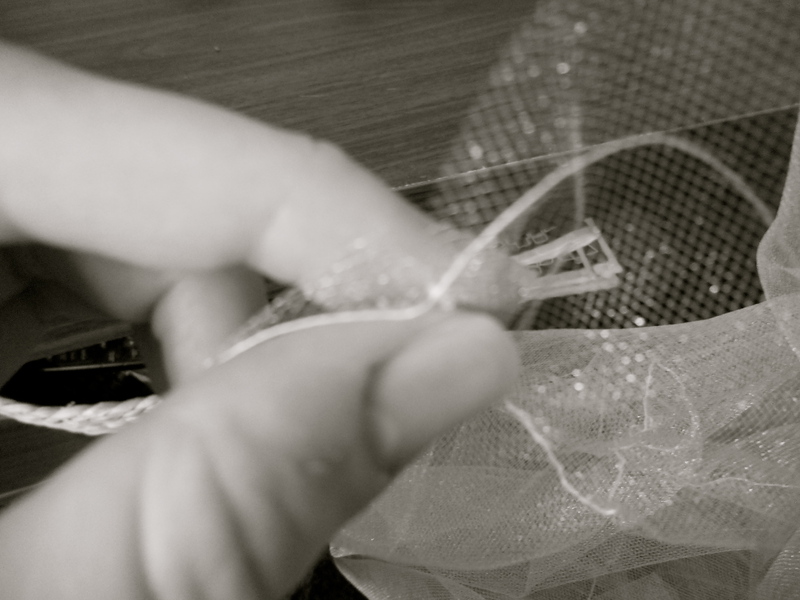 If you’re handsewing, make sure you tie the thread through a stitch (don’t just tie a knot in the thread). Once you’ve done this, go to the other end of your stitching and find the top thread. Pull gently on this thread and gather the material. It will be quite poofy. Keep doing this until the gathered (stitched) side is approximately 1-2″ longer than the circumference of the trunk of your tree. Tie a knot at this end as well. 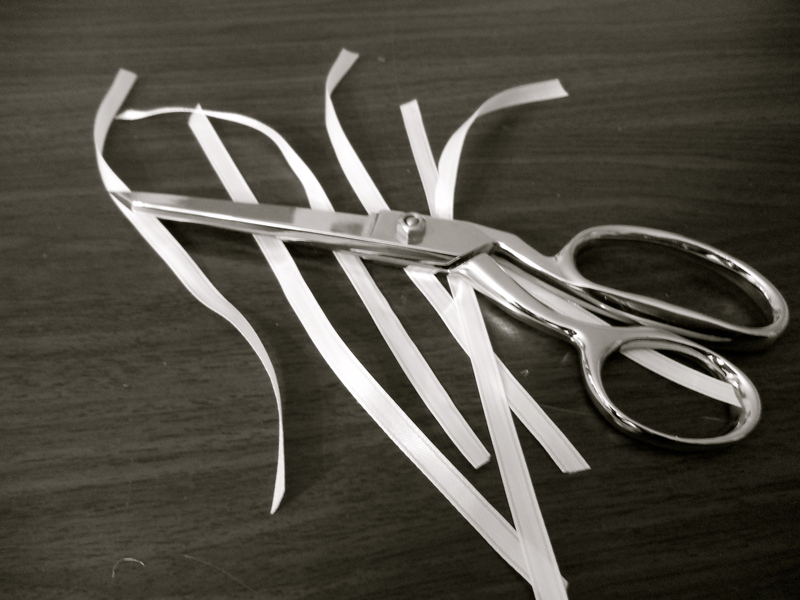 Cut six 8″ pieces of ribbon. These will be the ties that keep the skirt together. Along the two short ends of your fabric, mark a point at each end and halfway up the side. Place the pieces of ribbon between the two layers of fabric and stitch them in place, with approximately 7″ hanging out. Stitch over the ribbon 3-5 times. Clip all your threads short. Place the skirt around the base of your tree and knot the ties. Make sure to put the ties in the back of the tree. Unless you think they’re pretty, then you can leave them in front. Whatever. 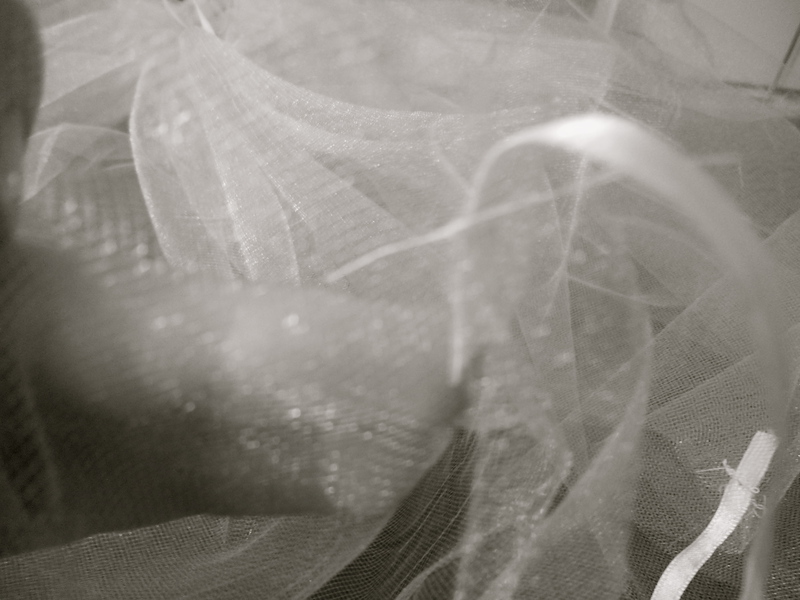 This whole project cost me $3 (I only had to purchase the tulle; I had ribbon already, but you can buy 10 yard rolls of 3/8″ ribbon for about 50 cents in many craft stores) and took me less than half an hour, including stopping to photograph each step. I put a white pillowcase over the plastic base of the tree, and then tucked our excess lights between the pillowcase and the skirt. Simple and cheap, and keeps your money out of corporate pockets! If you’re not big on crafting, but you still want to own something like this, you can check out any of the shops here. Also, don’t forget to check locally-owned small businesses in your area–you’d be surprised what you can find! That time of year is approaching. Carols (and hams) abound as we rejoice over our Savior’s birth (three months early). The air is thick with peace, love, and joy, as we all remember what’s really important. I’m sure many of you have heard of plenty of alternatives to this kind of capitalistic, materialistic madness. I particularly like Advent Conspiracy. If you’re not big on gifts, this (and other such organizations) is a great way to turn Christmas around. But me? I kinda like getting gifts. Maybe I’m selfish. Maybe I don’t have the right frame of mind. Maybe I just need a little more reverence. But there are so few times during the year (basically two) where I can justify asking for things that aren’t immediate needs. Where I feel okay tearing into brand-new books and CDs and wearing clothing I don’t necessarily need but kinda do and would really like to have. If you’re like me, things like Advent Conspiracy can make you feel like a jerk for still wanting things, for not being happy having your entire Christmas gift given to people who need it a lot more than you do. But take heart! There is still hope for us yet. This year, my husband and I are trying something new. We’re doing a sustainable Christmas. What’s that, you say? It’s this lovely idea we had that, instead of going out on Black Friday and putting our money into the hands to mega-corporations who have little concern for workers’ rights or environmental justice, we’re going to only give sustainable gifts. That means we’re getting our books, DVDs, and CDs from local used bookstores. We’re buying our clothing and home goods from thrift stores that benefit local charities. We’re handcrafting many of our other gifts, from decorative pillows to maple toffee syrup. We’re trying to use our money to benefit our community and to give gifts that can’t be bought at any given Target. And we’d love it if you would join us. Check local thrift stores, boutiques, booksellers, and the like for specific items. Visit craft and artisan fairs for unique gifts whose proceeds go directly to the people who made them. Utilize websites like craftgawker for ideas for making your own gifts. Take a look at all the marvelous shops on Etsy, if you’re not of the crafting persuasion. Consider giving baked or canned goods–this one usually saves you a good deal of money, as well as being quite tasty. Participate in Small Business Saturday. …and do anything else that supports your community, artisans, and small business owners. Make sure your money lands somewhere better than in some mega-corporation’s CEO’s bank account. To give you a hand in this, I’ll be deviating from the normal topic of this blog for the next six weeks to give you a how-to on many of the gifts I’m making this year. Additionally, I’ll provide links to places where you can buy similar items if you don’t have the time or ability to make them. I’d love your additions, too–if you’re creating anything this holiday season, whether gifts, decor, foodstuffs, or anything else, drop me a line and I’d be happy to feature it in this series.